This summer season, with the extended family most likely coming to visit, make sure your home is child proof to avoid any unwanted drama. STO Property Maintenance Group gives you some top tips for making your home child friendly. STO Property Maintenance Group specialise in home maintenance services and can assist you with any home improvements to make your home more child friendly. Our first tip is to install drawer and cupboard safety clasps. These devices will stop your child entering cupboards and draws full of unsafe items such as knives, bleach, and other chemicals. You can install these easily on your own by looping the plastic clip around the cupboard or drawer handles. More complicated versions are available and can be installed from the inside for a more refined look. STO Property Maintenance Group’s second tip is to install corner protectors. Every home has some nasty sharp edges, such as coffee table corners and the edge of kitchen cupboards. For children and babies, these edges can be very dangerous; especially as toddlers are more top heavy and prone to losing balance often. If you want to protect your child or baby from dangerous furniture edging, try installing self adhesive corner protectors. 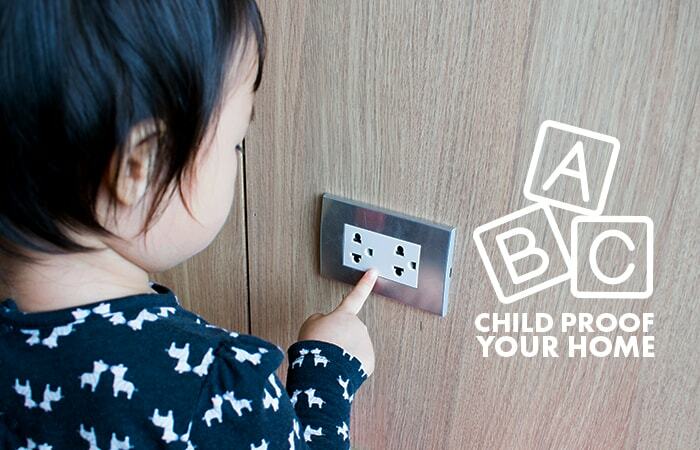 are a great idea and prevent children or babies from inserting anything foreign into power sockets and accidentally electrocuting themselves. STO Property Group’s fourth tip is to install portable child safety gates at the top of staircases and at the entry to rooms that have dangers to children or babies. It is often a good idea to use child safety gates to border off the kitchen, bathroom and laundry; where unfriendly chemicals often reside. It is advisable to use hardware to screw in safety gates at the top of staircases, as the pressure lock design can be susceptible to pushing out when weight is applied. Our fifth tip is to make sure that you install support braces behind bookshelves and the TV. You wouldn’t think it, but the toppling over of furniture and TV’s is one of the major causes of toddler hospitalisation. As TVs weigh a lot they can cause major damage to a toddler if they fall. To be safe, you should either secure the TV to the wall or try using a safety strap to prevent any falls. To prevent bookshelves and chests of drawers from falling try securing them to the wall with safety tethers. These simply screw into the wall and then onto the back of the bookshelf or chest of drawers. Then if your toddler gets curious and climbs up, there won’t be any accidents. If you’ve ever wondered how to make your house child proof, now you have all of the answers, thanks to STO Property Maintenance Group. STO Property Maintenance Group offers consultations, advice and home maintenance services that can help you to make your home safe for children. We can help you install all of the abovementioned safety devices and so much more. Contact STO Property Maintenance Group today to discuss your requirements with one of our experts. We provide property maintenance services to the Gold Coast, Brisbane and Sunshine Coast.